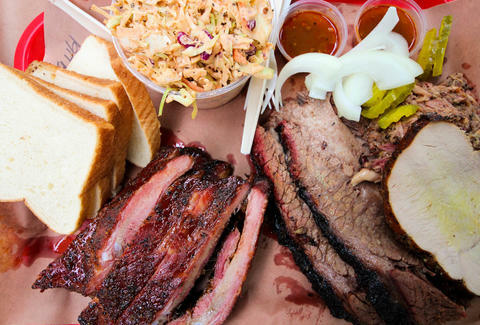 JMueller BBQ has been rechristened La Barbecue after disputes that ultimately led to the South 1st trailer's pit boss being replaced by his second-in-command: a competitive circuit up-and-comer who also cut his teeth at Franklin, a difficult task given the tenderness of their beef. 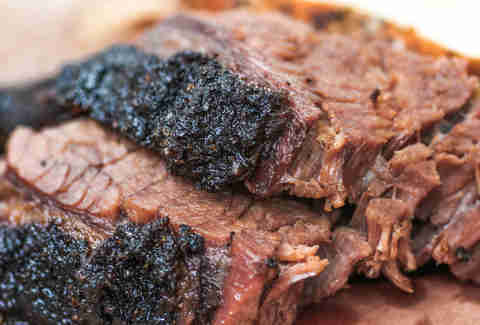 The new guy's style merges old-school techniques with an approach as free of dogma as your DVD collection, marked by more complex rubs (the brisket's uses five ingredients instead of the traditional salt/pepper), higher quality post oak, and air-flow improvements to the ancient pit to accommodate a lower, slower smoking approach. Beef now hails from the cattle world's Neiman Marcus (Niman Ranch), while new menu items count Hot Guts sausage ground in-house with a kick of red pepper, a blasphemous pulled pork, fresh toppings like cherry peppers and jalapeno jack cheese, and a revamped sauce brothed from pork bone. In the future they hope to add options like house pickled onions/jalapenos as well as pork belly sliders, throwing TX tradition out the window... then using the same window to pass you something that also tastes pretty damn good.